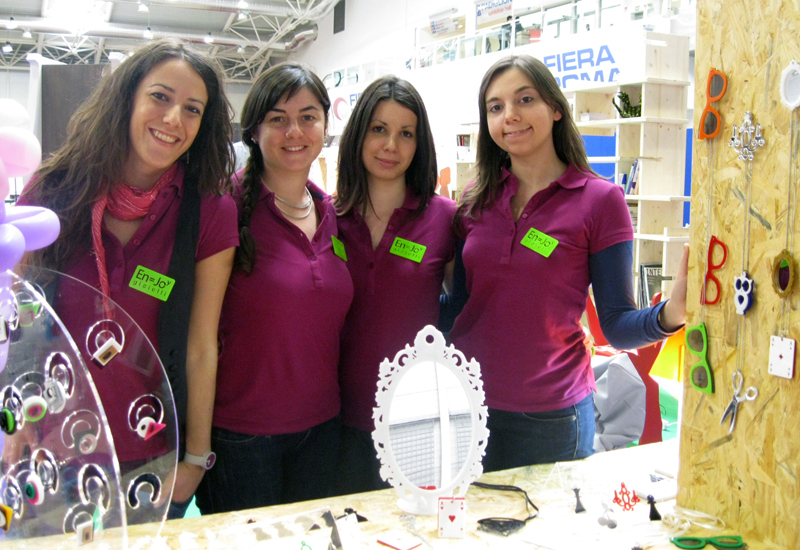 Four young women and a laser cutter... what might they come up with? Add to the mix a truly pop aesthetic and a ton of colour and fun and you get En=Joy® gioielli! This is their story. Where are you from and how did you meet each other? The 4-woman team at En=Joy® gioielli is composed of Federica Massi, Fabrizia Petrillo, Cristina Reggioli and Giuseppina Scarico, all from Rome. Ours developed out of a professional relationship, as we are all young designers with a common passion for art and experimenting. We are influenced by formal and technological research in costume jewelry; in particular we develop pieces using CNC and Laser cutting machines, and the latter is what has really taken off, allowing us to create unique and original costume jewelry. How long have you been using laser cutting to make your jewelry? We've been using laser-cut since the start of our company, but it'd be correct to say that En=Joy® gioielli was born thanks to this technology. Amongst all the CNC machines, the laser is the one that we got most excited about and it generated all sorts of ideas. Of the materials available with this technology, acrylic is our favourite because of its light-capturing qualities and for the amazing colour range in which it is available. 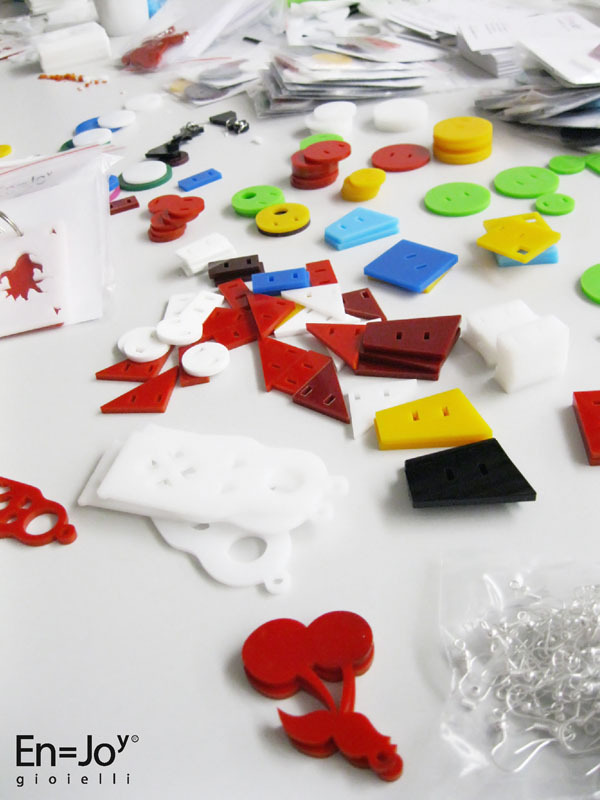 The mix of material and technology is what guides our creations, resulting in a satisfying result, we think. Of course, laser-cut has some limits, namely that of working primarily in two dimensions (in the case of our jewelry) - the third dimension being the thickness of the material - but more than a limit we've taken this as a challenge to develop complex objects in which the intersection of parts lends materiality. All three of these are important factors, and rather than prioritizing one, the synergy between the three is a conditio sine qua non. We are particularly proud of our technical know-how that allows us to use complex machines by ourselves and carefully carry out every part of the process. Independent design or collaboration with industry - which is better for a designer's growth? Collaboration and comparison is, in the world of design, a very helpful element. Industry plays a role in product design in various ways, especially in that it's important to research our competitors in similar industries and keep an eye on their evolution. It's also helfpul to collaborate with large companies if possible to get sense of what productive processes on a large scale are like. Our brand name says it all: fun! En=Joy® jewels come out of humorous moments and we've always looked for the most fun ways to communicate and create our pieces. How important is it in your life to create? The desire to make things is certainly at the root of En=Joy®, and so is having inspiring objects around us. All our bijoux have a story around them and become symbols for those who wear them, to express a certain way of being. Yes, we feel that we are Makers, and we couldn't be anything else. We have always turned necessity into a positive element - we take care of every aspect around the creation of our jewelry, even the parts that don't necessarily fall into our range of competance, but we do everything ourselves to keep costs down. What do you like best about MakeTank? We were struck by the way that MakeTank is so in line with our way of working! In particular, two factors won us over: the attention given to the Maker's process, and the professionality of the project, which is executed well both technically and in terms of communication and marketing. With thanks to Fabrizia and the whole four woman team for this interview! 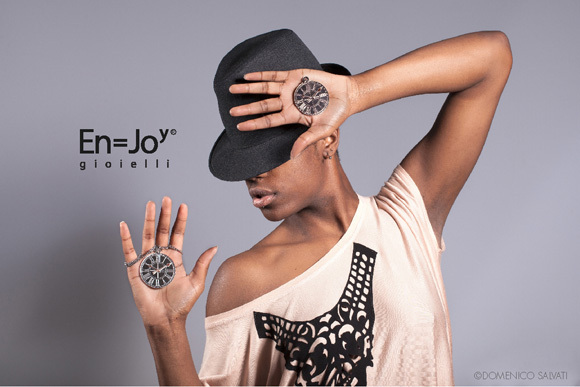 Want to see their creations from close up and perhaps buy a few in the En=Joy® Gioelli store on MakeTank? !